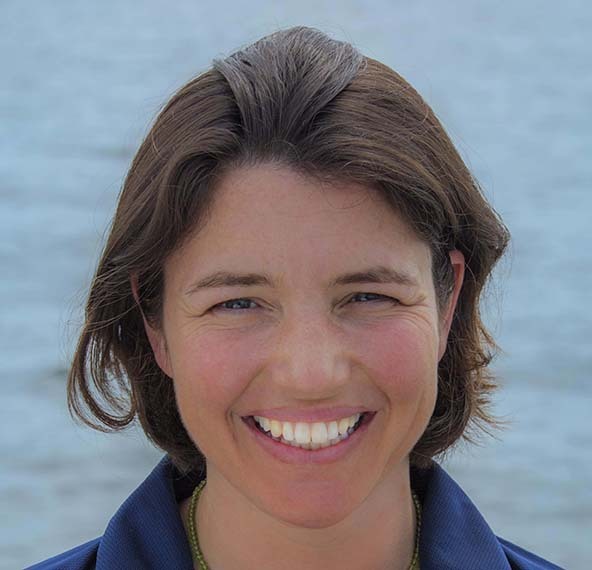 Jewels of the Gulf: Meet the scientists! 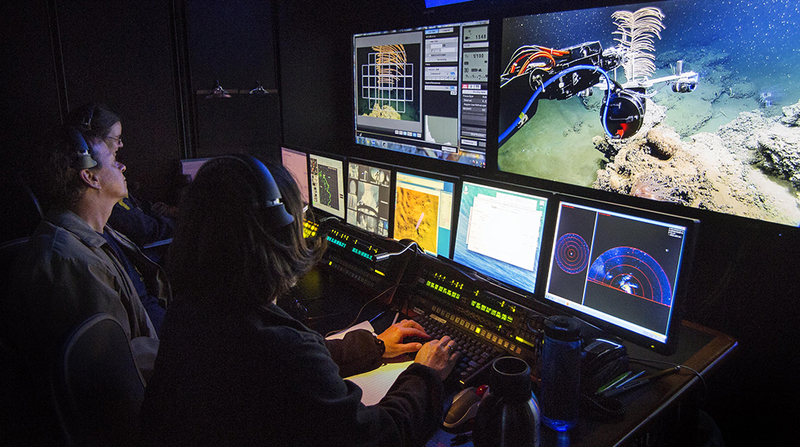 Researchers inside a ROV control room, imaging deep sea corals. Photo courtesy of Ocean Exploration Trust. 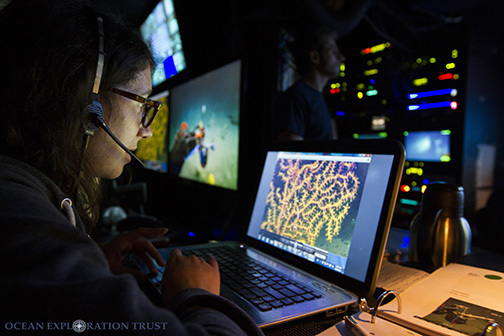 The Jewels of the Gulf: Deepwater Expedition leaves Monday, June 12th to investigate the impacts of oil, methane, and chemical dispersants on the deep sea ecosystem - in particular deep sea corals. Deep sea corals are ecologically important and provide vital habitat for marine life, including commercially important species like shrimp, crab and grouper (read more about this expedition on our expeditions page). The institutions participating in this expedition include Pennsylvania State University, Temple University, Lehigh University, University of Georgia and the U.S. Geological Survey. Get to know some of the researchers on board! 1. Where did you grow up? Was the ocean a big part of your childhood? I grew up in Cologne, Germany. Growing up, we camped for six weeks each summer somewhere in Greece. The Mediterranean has the most spectacular deep blue color and I loved snorkeling, swimming and kayaking. 2. What university/agency are you currently affiliated with and what is your title? 3. What is your main science goal for this expedition? As the chief scientist my main goal is to do achieve all the science goals we have set for ourselves. 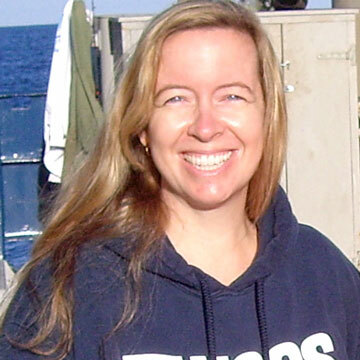 These include monitoring impacted corals, understanding if natural hydrocarbon seeps affect deep sea corals differently then anthropogenic oil inputs, how the microorganisms in the water column, sediment and in the corals interact to use hydrocarbon, collect live animals for lab experiments and understand how coral populations are connected to each other via larval exchange among others. 4. What is one thing you'd like for others to know about the impacts of the Deepwater Horizon oil spill? The impact of the oil spill was profound in the deep waters of the Gulf of Mexico even though the effects were much harder to observe. Most folks think the deep ocean floor is a desert with few living things but this is not the case. Not only is the deep ocean floor alive with animals and microbes, these critters are connected to the shallow ecosystems and ultimately, us. 5. How many research expeditions have you been on in your career? Many, many shallow water expeditions (with SCUBA diving) but this will be my 4th deep ocean cruise. 6. What inspires you to study the deep sea? I love the challenge of imaging live and understanding how it works in a setting that is so alien to us land animals. 7. If you could be any ocean animal, what would you be? Saint Louis, MO. Yes and No. I was always fascinated by life in the ocean especially since I grew up in the center of the continent almost as far away from the ocean as possible. I never experienced the ocean until Middle School when my family took a trip to Florida and I was hooked. A couple years later, I visited Florida again on a school trip and snorkeled on a reef in the Florida Keys. Once I saw the diversity of life, I knew I wanted to study marine biology. I am a Ph.D. candidate at the Pennsylvania State University. My main science goal for this expedition aside from helping with the coral monitoring work is to threefold. First, we are continuing our work to study the effect of natural hydrocarbon (oil & gas) exposure on corals. We will be sampling some corals growing near cold seeps (places where hydrocarbons bubble out of the seafloor). Second, we are studying the role of the microbiome in deepwater coral (the microorganisms that live on or near the corals). We will be collecting samples for 16S sequencing, metagenomics, metatranscriptomics and microscopy. Finally, we will be collecting live coral colonies to bring back to Penn State to run an experiment. We will be investigating the toxic effect on corals of oil and dispersant incorporation into marine snow aggregates. I would like people to know that the impacts are still manifesting themselves and the damage already observed will have very long lasting impacts on deepwater coral communities since they are very long-lived and slow growing. I have been on 4 research expeditions. Three in the Gulf of Mexico working with deepwater coral and 1 in the Lau Basin between Fiji and Tonga working on hydrothermal vents. Life in the deep sea is so different from life we are familiar with yet it covers most of the world's surface. Bowhead whale. They're big, smart, travel the world with ease and can live over 200 years. Most of my childhood was spent in Austin, Texas. Even though I grew up in a landlocked city I developed a love for the ocean and marine animals at a very young age. One of my teachers in elementary school was really passionate about our marine science unit, even taking our class down to Port Aransas, Texas for a beach clean up, and those experiences are what really sparked my interest. Also, I have really amazing parents who incorporated aquariums and coastal visits into our family vacations whenever possible, which fostered that initial interest and contributed greatly to my decision to pursue a degree in oceanography. 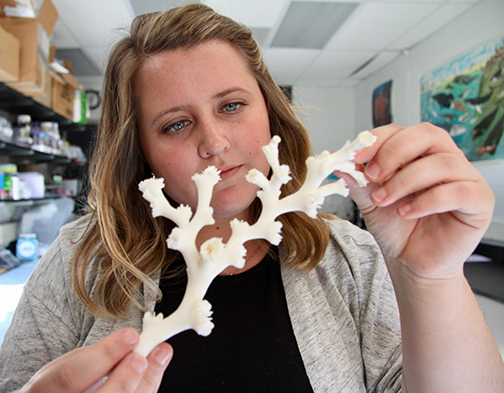 I am currently a PhD Candidate in the Biology Department at Temple University in Philadelphia, PA.
My main science goal for this cruise is to successfully collect live Lophelia pertusa (a prominent deep-sea coral found in the Gulf of Mexico) to bring back to Temple University. We collect these coral colonies from around 500 meters depth and then keep them in chilled seawater aboard the ship to keep them alive. 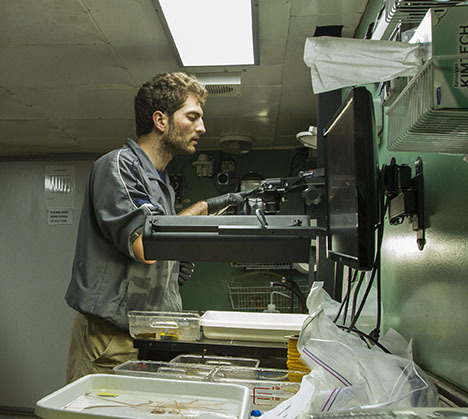 Once we return to shore we transport the corals back to Philadelphia and keep them alive in special temperature-controlled aquaria. We will then run experiments with these live corals to better understand how the exposure of oil and dispersants could affect their overall health, on both the physiological and molecular level. One thing that I think is really important to understand about the Deepwater Horizon oil spill is that impacts result from not only the oil spill itself, but from oil spill clean up as well. The chemical dispersants released after the oil spill can result in more harmful effects to biology than the oil alone. This will be my second research expedition. My inspiration for studying the deep sea stems from my love for exploring the unknown. There is still so much to learn about the ocean in general and even more so in deep-sea ecosystems. Also, I fell in love with marine invertebrates (e.g. corals) during my undergraduate and am amazed at how they have adapted to so many different environments throughout the ocean! I grew up in Bogotá, Colombia. Bogotá is a big city, of more than 8 million people, located on the Andes mountain chain. I was very far from the ocean (~20 hours driving), however my curiosity about it grew as I learned from books I found in the library. As far as I can remember, I always wanted to be a marine scientist. I am a Visiting Assistant Professor at Lehigh University. My main objective is to collect samples of coral populations for genetic analyses, including populations impacted by the Deepwater Horizon oil spill. These genetic analyses will allow us to understand the relationships of coral populations across the Gulf. This information will inform the long-term potential for recovery of impacted coral populations, and their resilience to disturbance. The Deepwater Horizon oil spill impacted deep-sea animals like corals, some of which have lifespans of hundreds of years. These ecosystems will likely take a long time to fully recover. 12 in person and 7 via telepresence. The fact that it is the largest environment in our planet, yet we have only studied a tiny fraction of it. There is so much to learn and discover! I would be a giant squid. I grew up in East Lansing, Michigan, home of the Spartans. While there isn’t an ocean close to my home town, I spent many summers at the beach with my family, walking along the shore, swimming and body surfing the waves. I really enjoyed spending time digging in the sand, searching for critters, including small bivalves and sand crabs. I currently am a Research Ecologist at the Wetland and Aquatic Research Center, US Geological Survey. My group has been tracking how the animal communities living in the mud, called infauna, are changing following the spill. Some of these animals are extremely sensitive to environmental change and serve as useful indicators of pollution disturbance, in particular. In addition, we are measuring the sediment chemical environment, in collaboration with the University of Georgia, to help improve understanding of what factors may be influencing these communities. We have learned so much after the incident occurred in 2010. While I wish this event had never happened, we know more about the Gulf of Mexico in general and its deep-sea environment, specifically, which will help us to better track future impacts and events, whether human-induced or from natural factors. When the spill occurred, there were news articles that suggested that there would be little impact to the deep sea because people thought there wasn’t much down there. However, through our work and research by many investigators, we all have shown that the DWH event touched many environments, from the coastal zone to the deep sea, and we are continuing to see changes in the deep-sea habitats that we are monitoring. I recently tallied up these numbers, and including this expedition, I have spent ~490 days at sea on 32 separate research expeditions. Every expedition reveals something new to me about the deep sea. I’m always seeing new animals or we are exploring an area or feature for the first time. Having the chance to explore new areas or learn more about deep-sea organisms and what makes them tick is really exciting and inspires me to keep coming back for more. This is a very funny question because I don’t think I would want to be any type of animal that I study because benthic infauna don’t get to move around very much. When I’ve been asked this before, I’ve answered that I think I would have to be an animal that moves around because I don’t like to stay put for any length of time. I get a thrill traveling to new and different places or at least getting to travel at all, so either a sea turtle of some sort or a tuna would be my choice. They get around. I grew up in South Africa, in a coastal suburb called The Bluff. Ours was one of a dozen houses actually down on the beach. If you're thinking “glamorous,” think again—“TIA” (this is Africa). We didn't have much, we had the beach, that was enough. My childhood was an endless precession of surfing, swimming, diving, and fishing. We planned our days around the tides and winds—with good surf taking precedence over everything, including school. 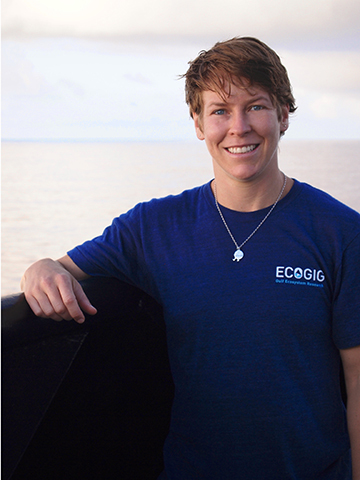 I'm on this ECOGIG expedition as a postdoctoral scholar at the Pennsylvania State University in Chuck Fisher's lab, but I also work as a marine biologist for Fisheries and Oceans Canada. To avoid chaos, organizing the incoming and outgoing streams of data during our 2 weeks of 24 hr per day operations. Although I'm a research scientist, I'm here helping my colleagues, collecting and managing the mass amount of data piped up from the underwater remotely operated vehicle (ROV). This data comes fast and furious, as terabits of still images, videos, logging, navigation, onboard sensors, etc. For this particular task, my compulsive personality is a real asset. I'd want people to appreciate that so much of the oil spill sunk, impacting ecologically-important deep-sea coral habitats for an unknown extent of time. This research is still developing, as years later we are discovering impacted coral that initially survived the spill are now more vulnerable and susceptible than corals outside the spill area. I've lost count—which is pretty cool. Dozens? 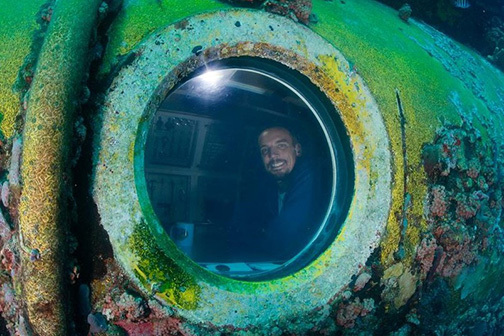 I've had the fortune to go on a variety of research expeditions in a variety of habitats with many different submersibles. Some of my favorites are expeditions to hydrothermal vents, seamounts, and deep corals reefs. The images! For me, studying the deep sea is all about capturing a new deep-sea species, new behavior or new phenomenon with photographs and videos. On the science end, I can rigorously analyze images of the deep sea and almost always discover something new. These same images also double as a means of engaging the public, getting people excited about the ocean. Who doesn't love the idea of exploring the great unknown? I practically hear the National Geographic theme music just thinking about it. A blue whale since I'd love to spend my days swimming, jumping, and singing in the big blue...I was considering "great white shark" but I don't eat fish... I'd make a terrible shark! I grew up in Nice, a French city on the Mediterranean coast. My mother was a diver and she introduced me to diving when I was 10 years old. I also learned how to sail when I was about the same age. One of my favorite things to do as a kid was to walk around the harbor and look and yachts. I am currently a fourth-year Ph.D. student at Penn State University. I am here to take photos of corals that we have been monitoring since 2010 or 2011. We have been coming back every year to the same sites to take photos of the same coral colonies. Some of these corals were impacted by the Deepwater Horizon oil spill and my main goal is to use these photos to assess the recovery of impacted corals and measure growth rates. The Deepwater Horizon oil spill had a long-term impact on corals. Colonies that were heavily impacted are not recovering and some of them are getting worse (less healthy branches and increase in branch loss). Corals are long-lived organisms with a slow metabolism. It will probably take decades before they recover and probably centuries for them to grow back to their original size if they lost branches. I have been on six research expeditions so far. Five in the Gulf of Mexico and one off Tonga, in the Southern Pacific, to study hydrothermal vents. I took a class about the deep sea when I was doing my Masters in Oceanography and immediately knew that it was what I wanted to study. Even though the deep sea is the largest ecosystem on earth, we know very little about it. Every dive is really exciting because of the potential to make new discoveries! I would like to be an orca because I will be able to travel around the world's oceans and won't be bothered by any predators. I grew up in Washington DC and moved to Colorado when I was young so I didn’t get to spend a lot of time around the ocean but my family had a cottage on Lake Huron we would visit every summer. It wasn’t the ocean but to a little kid it might as well have been. I felt like it was so vast and mysterious and anything could be below the water. That’s where I really started to love being on the water. I am an Eberly Research Fellow of Penn State University. To make sure we get the best data possible while learning as much as I can about deep-sea ecosystems! I did all of my PhD work in shallow, tropical reefs so this is expedition is a chance for me to assist my colleagues and expand my research into new areas. That they are still ongoing. I think a lot of people see that spill as a tragic event from the past and don’t realize that ecosystems and communities are still coping with the consequences of that disaster. I’ve been on a lot of research expeditions on shallower reefs but this is my first deep-sea research expedition. I think it’s fascinating because it’s such an inaccessible, alien world. 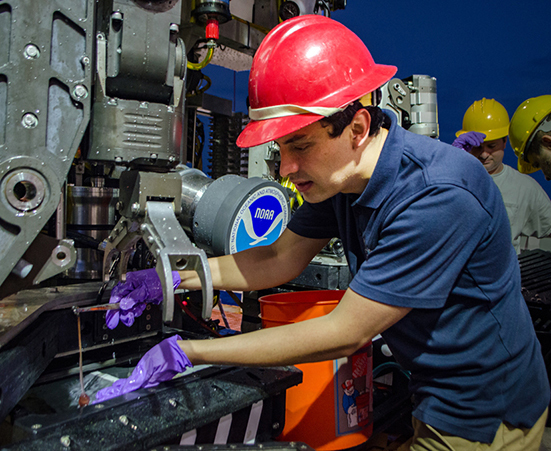 For a long time, everything we knew about the deep-sea came from these little snapshots based on what we could pull up off the seafloor but now we can actually visit this environment and spend time there so it is such an amazing opportunity to explore and learn. A thick-billed murre. I’m not sure if that’s cheating because they’re actually a type of seabird but they can dive below 200 meter and still fly so I feel like I’d be getting the best of both worlds.